What Makes a Micropayment Solution Succeed? This master’s thesis is part of the 4.5 year Master of Science program at KTH (“Kungliga Tekniska Högskolan”, or “Royal Institute of Technology”), Stockholm. I paused my studies there in 1998 to pursue a career as an entrepreneur. It started with Netbreeze, a small company through which I did freelance consulting within software design. It then continued with Goyada, a company that creates, aggregates, and distributes mobile services and m-commerce systems. I am now in the process of starting up a third company, this time within the mobile applications field. In early 2002 Goyada released an online payment solution named YadaPayment. In conjunction with designing and implementing YadaPayment I concluded that this would be an interesting topic for a master’s thesis, and that the thesis could help us identify the best strategic direction for YadaPayment in the future. This thesis is what you are now holding in your hand, or reading online. The work was sponsored by Goyada and carried out on a part-time basis during the period June to November 2002. The examiner was Carl-Axel Engdahl of the Department of Applied Information Systems, KTH, and the supervisor was Erik Landberg, chairman of the board at Goyada. Being a teacher at heart I like to describe things in a clear and simple way with plenty of metaphors and examples. My goal was that people with no knowledge of payment systems and e-commerce should be able to read and enjoy this report. For this reason I have used as little technical jargon as possible and those terms that I have used are clarified using footnotes. A large number of people have actively helped me with this endeavor, without their help this project would have been impossible. ... Sophia, my lovely wife, for unfailing moral support. ... Patrik Pernber at Goyada for agreeing to sponsor the project and allowing me to work part-time for several months to complete it. ... the tech team at Goyada for letting me off the hook during this period. ... Erik Landberg for agreeing to be my supervisor and providing me with valuable contacts. ... Carl-Axel Engdahl for agreeing to be my examiner and helping me with all the practical issues..
... Göran and Jesper Edman for letting me live and work in their apartment in Tokyo and providing me with many important contacts. ... Geoff Hansen for letting me live and work in his house in San Francisco. ... Steve Rapaport and Sabina Romlin for offering to let me live and work in their house in Sicily (although I regretfully never had the chance to take up the offer). ... Gunnar Kniberg and Miki Takehito for invaluable help with arranging interviews in Tokyo. ... Wouter van der Wijngaart, Takehito Wakayama, Yoshie Yasukazu, Ota Hidetoshi, Shunsuke Noda, Kenji Kuboshima, Masaaki Wakahara, Robert Grönborg, Magnus Nerve, Lennart Stenberg, John Lagerling, Patrik Karrberg, Mark Manasse, Pelle Hjortblad, Niklas Thurfjell, Stefan Stenberg, and Bertil Krumnack for letting me interview them. There is a common saying on the Internet: “Information wants to be free”. The problem is information is not free. Information is ultimately produced by people, either indirectly or directly, and most people need money to live. People are used to paying for physical products such as books, magazines, and videos. This is because it is expensive to create and distribute physical books, magazines and videos. Distribution of content through Internet is virtually free in comparison, but there is still a cost. Web servers, streaming servers, robust hosting environments, servers, and fast Internet connections all cost money, and there is of course still the cost of creating the information the first time. Consequently it does not make sense to distribute information services for free – someone has to pay. It does not either make sense to charge large amounts of money for information services, since the distribution costs are significantly lower than for corresponding physical distribution. Physical information products are often distributed in chunks. Magazines and newspapers, for example, usually contain a large number of articles. On the Internet, however, a user might only want to download one single article. There is obviously a need for some way to accept small payments online. There should be some way to pay €0.01 to view a single magazine article, or pay €1 to buy a better set of hockey clubs in an online hockey game. These types of small payments are known as micropayments. There is no exact definition of how small a payment must be to be considered a micropayment, so in this report I will place the threshold at €1. There are literally hundreds of online payment systems available such as PayPal, ClickMiles, Cybergold, Cybermoola, E-gold, FirstLook, FreeRide, GiantRewards, iWon, Memolinks, Millicent, Mint, MyPoints, PointClick, TargetShop, Visa, and many more. Some require you to pre-deposit money in an account, some identify you via your cellular phone, some are virtual currencies that only work online, some work like electronic checks, and some provide the electronic equivalence of cash in your pocket. Most Internet users have not heard of more than two or three of these, if any. Very few payment solutions have succeeded in any global scale, especially when it comes to handling of micropayments. Why is this? Why have certain payment solutions become widely established while others have faded away? This report attempts to find out what it takes to make a micropayment system succeed. · Identify the key characteristics of payment systems in general. · Gather a list of known payment systems today on various markets, classify them into groups, and compare their characteristics and level of success. · Interview relevant companies in three different markets: Sweden, Japan, and USA. · Take a closer look at some of the micropayment systems and determine why they have succeeded or failed. · Identify the most important factors determining the success or failure of a micropayment system. In order to limit the scope this report will focus mostly on small payments from buyers to merchants. Large payments and person-to-person payments will only brought up when necessary. The task of determining what makes a micropayment solution succeed is by no means an exact science. Any strictly scientific or statistical analysis of all the available data would require far more work than is warranted for a master’s thesis project. Instead I will try to get a broader view of the topic and establish a conclusion based on subjective observations and deductions. There will be three key processes in this report – establishing a theoretical model, gathering information, processing information, and forming a conclusion. The theoretical model will be established by establishing a vocabulary and then analyzing, from a theoretical perspective, the fundamentals and key characteristics of payment systems in general. · Personal interviews with payment system providers and merchants in several different countries. · Published material in books, magazines, newspapers, and on the Internet. · My own personal experience within the field. Processing of information will be done by creating a database of all payment solutions and identifying common denominators between them in order to define a smaller set of payment system groups. A few representative payment systems from each group will be analyzed further by gathering facts such as number of users, costs, technical solution, etc. A subset of the representative payment systems will be further classified as success stories or failure stories. The conclusion will be formed using a combination of deduction and induction to identify general patterns that appear to determine the success or failure of a payment system. The conclusion will be general in nature. Goyada, who sponsored this project, will receive a more specific analysis relating to Goyada’s product suite YadaPayment. The more specific analysis is confidential and will not be included in this thesis. Chapter 5 What is a payment system? The term payment system is, in the context of this report, defined as a collection of technologies, laws, protocols, and customs that make it possible for people and companies to pay money to each other. Payment systems are one of the fundamental pillars of modern economies. Some examples of widespread payment systems are cash, credit card, and check. One of the most important concepts of any payment system is money. Money is the term used to represent purchasing power within a payment system, in the same way that weight is the term used to describe how heavy something is. Money can be represented by different types of currencies such as US dollars and Euro, just as weight can be represented by different types of units such as kilograms or ounces. A payment system must address many questions related to money. How do you know how much money you have? Where is it stored? How do you access it? How does the system keep track of who owns which money? How does money change ownership? Which currencies can it handle? How do you withdraw money from this system into another system? Are monetary transactions traceable? Amount – how much money is in the set. For example 30. Currency – what type of money is in the set. For example Yen, Swedish Krona, MyPoints, free pizza coupons, promissory notes, etc. Form – the physical representation of the money. For example physical cash, electronic cash, or account. Location – where is the money located. For example in my pocket, in the top drawer of my desk, in a specific bank account, or in a smart card. Account #123456 at Skandiabanken, Sweden. Locked in my safe at home. Not all money can be used everywhere, it is up to each merchant (and to a certain extent the laws of the country in which the merchant operates) to decide which types of money he accepts. US dollars are accepted in most parts of the world, although for large payments it is in some cases only accepted in electronic form (for security reasons). MyPoints are only accepted by specific merchants such as Kmart, Barnes & Nobles, and Hollywood video. Eurobonus points are only accepted by SAS and its partners. In many cases it is possible to transform money from one currency to another. At most airports you can hand in physical dollar bills and receive corresponding bills for the local currency, such as SEK. Using a bank teller machine in Japan it is possible to take out physical JPY bills from a bank account that contains USD. The location of the money determines which payment systems it is available in. Some payment systems handle multiple currencies and some currencies can be used in multiple payment systems. For example I might have physical Euros in my pocket, electronic Euros in a bank account, and electronic Yen in another bank account. There are basically three forms in which money can be stored – physical cash, electronic cash, and bank accounts. The most common representation form of money today is cash. Cash is represented as a set of physical tokens that are generally accepted as having a certain value. Cash must be easy to carry around and must be easy to divide into smaller pieces and aggregate into larger pieces. Examples of cash are valuable metals such as gold and silver, printed bills, coins, cigarettes, etc. Basically any type of physical token that is accepted as a having a certain given value in a given society. In our society today cash is usually represented as paper notes and metal coins that are backed by a government and distributed by a central bank. The saying “cash is king” certainly has some truth to it. Cash is a very simple and convenient payment system. If I want to buy a book I can go to a bookstore, take out some bills from my pocket, and pay for the book. No identification is necessary, no signing of papers, no logging in, etc. Ownership of cash is based on a very simple model – the person who is in physical control of a coin is the owner. If one person gives a coin to another there is very little risk of the coin disappearing or being duplicated along the way. No audit trail is left, i.e. no one can trace my spending habits if I only use cash. So why don’t we just stick to cash? The fundamental problem with cash is that it gets complicated if two people want to exchange money without meeting physically. I could send you cash in an envelope or perhaps involve a third party who in turn can meet you, but that slows down the transaction considerably and introduces a host of new issues related to security and trust. Other representation forms for money are more suitable in that case. Another problem with physical cash is that a currency typically has a fixed set of denominations, which makes it difficult to handle extremely large or extremely small transactions. For example Swedish Krona is available in the following denominations: 50 öre (= a half Krona), 1kr, 5kr, 20kr, 50kr, 100kr, and 500kr. This means it is impossible to make a payment of 1.34 kr with physical cash. Large payments, for example one billion kr, are inconvenient due to the large number of bills required. Apart from the obvious security risk, just counting the bills would take extremely long time. Buyer and seller can remain anonymous. Can be moved around without involving external parties. Guaranteed payment – the physical handover of cash completes the transaction. Can’t be stolen without physical contact. Stable representation form, can’t be destroyed without physical contact. You can see how much money you have without involving external parties. Does not require a working legal system. If a society breaks down goods such as food and cigarettes can still be used as cash. Money doesn’t know its owner. Difficult to trace when stolen. Difficult and expensive to transport over large distances. Easy to lose without trace. Impossible to handle transactions smaller than the lowest currency denomination. Difficult to handle very large transactions. Problem with lack of change sometimes. Electronic cash is similar to physical cash except that it is, well, electronic. Since you can’t carry around electrons they must be stored inside some kind of device. The device must be small enough to be portable yet sophisticated enough to make it difficult to tamper with. Unless the electronic cash storage device is very advanced, a separate device may be necessary in order to execute payments. Small cards with microchips, commonly known as smart cards, are the most common way to store electronic cash. The microchip contains software to store the money, protect it, and safely execute transactions. Just as with physical cash you carry it around and can therefore lose it without trace. Unlike physical cash the money can be transferred between people without physical contact. The money can also disappear or be duplicated without trace, which places requirements on the payment system in order to minimize the risk of this happening. There are many different payment systems based on electronic cash, some of these are described in chapter 9.9. Easy to handle small transactions. Amount of physical space fixed, not relative to amount of money. Purchases can be made without physical contact. Can be anonymous or non-anonymous. Volatile, can be destroyed without physical contact. Requires a working legal system. For the purpose of this report a bank is an institution that lets you transform your cash into virtual money. Virtual money exists but has no physical form and no physical location. Electronic money is the most common form of virtual money, but strictly speaking virtual money does not have to be electronic. I can run a bank with nothing but paper pencil to keep tabs of accounts, balances, and transactions. When you put money into a bank account your money is no longer physical, i.e. it is not placed in a physical box with your name on it, the bank clerk cannot point to exactly where your money is located. Hence the quote “Cyberspace is where your bank is storing your money right now”. When your money is in a bank account you can no longer easily walk down to a bookstore and buy a book by handing coins to the merchant – you have to go the bank to take out your money or write a check. However your money in the bank can be used to efficiently pay money to people without having to physically meet them, especially if the bank is part of an international network. If a merchant has an account in the same bank as you, you can call the bank and have them transfer the money to the merchant’s account. If your bank account is connected to a credit card you can make a purchase over the Internet and the seller can deduct your account himself. Who is allowed to access the account? How do people withdraw or deposit money from the account? How do people identify themselves when trying to gain access to the account? How do people make payments to merchants from the account? What interest rates should apply to the money stored in the account? What costs should be involved when doing monetary transactions with the account? What type of historical information should be stored and who should be allowed to access it? What policies apply when moving money to or from a different bank? Cash-based payment systems and account-based payment systems coexist peacefully and will probably continue doing so because they do not compete. Cash has certain advantages that bank accounts can’t match and vice versa. Money can know its owner. Does not occupy any physical space for the owner. Money cannot be used or moved around without involving third party. Centralized storage of money means that in catastrophic cases large amounts of money can be lost without trace. You cannot see how much money you have, only what the bank tells you. A payment system can be evaluated based on a number of different criteria. Too much or too little money was paid. The money was deducted from the buyer but not credited to the merchant, i.e. the money disappeared. A third party gained access to information enabling future criminal activities such as stealing from the buyer, repeating the same transaction in the future, posing as the merchant in order to receive the money from future buyers, etc. A third party gained access to information about the transaction, thus comprising the buyer’s personal integrity (assuming of course that the payment system was supposed to protect the buyer’s integrity). Security is often described using technical jargon such as digital certificates, key lengths, man-in-the-middle attacks, encryption algorithms, signatures, certificate authorities, revocation lists, and such. I prefer describing the security of a system in terms of what is needed to break it, rather than what is there to protect it. “Something you know”, for example identifying yourself by presenting a password. “Something you have”, for example identifying yourself by showing a passport or putting a smartcard into a card reader. “Something you are”, for example identifying yourself by placing your thumb against a thumbprint scanner or by peering into a retina scanner. All three authentication schemes can be forged with varying degrees of effort. It is rather easy to pose as someone else if all you need is to know (or guess) his password, however it is close to impossible to pose as someone else if you need to pass a retina scanner. · Find out somebody’s credit card number, expiry date, and full name. This is not so difficult; there are numerous illegal databases on the Internet containing stolen credit card information. · Set up a Visa-enabled merchant, or make a shady deal with an existing one. Of course, if the victim notices that his account has been debited without his permission Visa will attempt to force the merchant to refund the user, and if the merchant has disappeared Visa themselves will refund the user. However this is an expensive and cumbersome process. The user will be angry, and Visa cannot always be sure that the merchant is the perpetrator since internet-based merchants don’t have a reliable way to check that a credit card is being used by its registered owner. A smart criminal will deduct small amounts of money from many users rather than large amounts of money from few users, since many users won’t notice a very small but unidentified deduction in their bank account statement, and even if they do they are unlikely to want to press charges for such small amounts. Credit card information is difficult to protect since credit card details are usually clearly printed on the card and are known by every merchant that the user has ever made credit card purchases through. For an active credit card user that is a large number of people, each one a potential criminal who might misuse the information years later. The Swedish bank SEB has a service that is a good example of a more secure payment solution. · The bank website gives the user an 8 digit “challenge”. · The user starts his digipass, enters his 4-digit personal pin code and the 8-digit challenge. As a response he gets a temporary 6-digit login code. · The user enters the 6-digit login code on the website. · The bank uses cryptographic techniques to authenticate the user. A payment through SEB is considerably safer than a credit card payment since it is based on “Something you have” (the digipass) as well as “Something you know” (the pin code). If you live in Germany and receive your paycheck in physical DM bills you can walk down to a store and purchase a book with that money. If you receive your paycheck as an email through PayPal it is not quite as easy. First of all you have to register on www.paypal.com in order to actually receive the payment. Second of all the bookstore clerk has to do the same thing in order to accept a PayPal payment. If you are standing in the bookstore and want to pay with PayPal both you and the sales clerk would need access to an Internet terminal as well. Joining a payment system is the act of making that payment system and its currency available to you for future purchases. For some payment systems, such as credit cards for certain banks, this can be quite a cumbersome process involving phone calls, paper forms, visits to the bank, costs, weeks of wait, etc. It may even be impossible to join because your credit rating isn’t good enough, you are too young, you are not a citizen, or you don’t have a bank account in a certain country. In other cases the process of joining is simple or even transparent, for example joining a payment system based on electronic cash cards may be as simple as walking into a store and purchasing a cash card. The act of joining a payment system often involves some kind of link to another payment system since it is usually desirable to be able to move money into or out of the payment system. For example if you join PayPal you need an existing bank account to link it to. If you purchase an electronic cash card you need to pay for that somehow – for example using physical cash. Payment systems that are complex or expensive to join must offer very significant and obvious advantages to users, otherwise they will not obtain widespread acceptance. Any payment system that is easy to use for users and merchants will be more likely to succeed than an equivalent system that is complicated to use. A merchant wants to focus on the customer and the sale, not the intricacies of the payment process. In the same way a user who is confronted with a complex payment process will in many cases be scared away, especially if the payment is small and unimportant. Physical cash is easy to use – just hand your coin or bill to the merchant and the payment is complete. Checks are also relatively easy to use, just sign a piece of paper and give to the merchant. Internet banks are usually more difficult to use, for example SEB requires a log in procedure using a separate physical device and multiple passwords. A payment system with many users and many merchants is pervasive; a payment system with few users and few merchants is not pervasive. Generally speaking, the more pervasive a payment system is the more attractive it is to both users and merchants. The need for pervasiveness is a “chicken and egg” problem that represents a large hurdle for any new payment system starting with 0 users and 0 merchants. Users will only want to join if there are many merchants, and merchants will only want to join if there are many users. The most pervasive payment system by far is physical cash. Cash is established as a payment mechanism in almost all countries of the world and there is an established system for exchanging cash of different currencies. Credit card systems such as Visa and MasterCard can also be considered pervasive payment systems, with millions of merchants in the world accepting credit cards and billions of users. A payment system always has costs involved. Some costs are direct (i.e. transaction related) such as the bank’s commission when processing a check; other costs are indirect such as the cost of purchasing a safe for storing physical cash. In some cases the user bears the costs, in other cases the merchant or a third party bares the costs. Physical cash is a relatively expensive payment system, although most of the costs are indirect and invisible to users. Cash gets worn out and must be replaced, cash must be stored in secure locations such as safes or locked cash registers, cash must be transported safely, and since cash is easy to steal it must often be insured as well. What does it cost to join the payment system? Who pays whom? What does a transaction cost? Who pays whom? What does it cost to move money from one place to another? Who pays whom? What does it cost to store money safely in a location? Who pays whom? What does it cost to produce new money? Who pays whom? If a payment system is too expensive for users they will not use it. If a payment system is too expensive for merchants they will not accept payments through it. Some payment systems allow credit, i.e. a negative balance, and others don’t. Physical cash does not allow for credit, because you cannot have a negative amount of coins in your pocket. Some bank accounts and credit cards, however, do allow a certain amount of credit. This is an important factor since it affects the level of trust needed between buyers and sellers, and the financial risk that sellers must be willing to take. Credibility, or trust, is a “soft” factor that is nevertheless an important one. If a payment system is based on a brand or currency that is widely recognized and trusted, more users will be willing to use it and hence more merchants as well. Visa and MasterCard are two brands that have achieved high credibility globally, while Millicent is a payment system that few people have heard of. Payment systems that are not based on well-known brands must find other ways to earn the trust of its users. All payment systems involve costs in addition to the payment amount of a transaction. For example when accepting a credit card payment a merchant must pay a certain fee to the acquiring bank. The economic model of a payment system is described by analyzing the payment flows within it – who pays who, how much, when, and for what? A payment system that is ideal for small payments might be unsuitable for large payments, and vice versa. Credit card payments have a transaction cost of approximately €0.5 which the merchant pays to the credit card company. When a user makes a €1000 purchase the transaction cost will be irrelevant, but when a user makes a €1 payment the transaction cost is significant – the merchant will only receive 50% of what the user pays. For this reason merchants typically don’t allow credit card payments below a certain amount. Cash is suitable for payments in the range €0.05 - €10000. A payment of €0.001 is impossible in many currencies due to the fact that they don’t have coins worth that little. A payment of €1,000,000 is also difficult using physical cash due to the cost, bulkiness, and risk of handling such large amounts of physical cash. Thus, the range of payment amounts that can be handled in a payment system is an important characteristic. A payment system that offers anonymous, untraceable payments is said to offer a high level of personal integrity. This may or may not be desirable depending on the situation. A drug dealer does not want the buyer to know who he is, and does not want anybody to be able to find out the transaction has taken place. An honest person who has just bought an expensive car, on the other hand, might want traceability so that he can prove that he has paid in case of a conflict. Payer anonymity - Can the payer be anonymous? Payee anonymity - Can the payee (or merchant) be anonymous? Transaction traceability – Is it possible to find out information about historic transactions? Cash offers relatively high personal integrity. Transactions are not traceable, and the payer and payee can be anonymous. However, for the payment to be convenient and secure the payer and payee must physically meet, which can be seen as comprising the anonymity of both the payer and payee. In some cases transaction speed is essential. For example when paying a highway toll a slow payment system that takes minutes to process a transaction could cause serious traffic congestion. For small payments on the Internet users might be scared away if the payment process takes too long time. Suica is a Japanese contactless electronic cash card used for train fares, and is a good example of a very fast payment system. All the user needs to do is hold the card over a sensor while passing through the tollgate. The payment will automatically be deducted from the card, no physical contact is necessary and the user doesn’t even have to stop moving. The transaction takes about 1 second (in addition to the time it takes for the user to dig the card out of his pocket). Another fast payment system is the payment card used when crossing Öresundsbron (a bridge between Sweden and Denmark). The payment can be registered from cars passing at speeds up to 70 km/h. SEB is a relatively slow payment system since there are many steps involved in each payment. The transaction time is at least 1 minute. In some cases the transaction itself is fast, but the clearing of the payment is slow, i.e. the buyer perceives the payment as fast while the merchant perceives the payment as slow since it takes a long time for him to actually receive the money. Credit card payments are an example of this. It usually takes less than a minute for the user and merchant to execute the transaction, but it may take several days before the merchant receives the money. Chapter 6 What is a micropayment system? A micropayment system is a payment system designed to handle small payments. For the purpose of this report I will consider a micropayment to be a payment of €1 or less. Whenever a payment takes place there is a transaction cost. Sometimes the transaction cost is clearly visible, for example the commission that Visa takes when executing credit card transactions. In other cases the costs are much more indirect. When making a cash purchase in a CD store there is no obvious transaction cost, but the fact that the store is dealing with cash means it has to have cash registers and a whole set of security procedures for safe handling of cash, all of which cost significant amounts of money. Looking at the above shopping list it is difficult to imagine making all those payments using a single payment system. Visa would work fine when paying for the house, but if the candy store accepted credit card payments for chewing gum it would lose money since the cost of processing the transaction would exceed the profit margin for chewing gum. The table below summarizes the importance of each payment system characteristic with respect to payment size. Each row is a payment characteristic and the columns to the right describe how important that characteristic is for small transactions compared to large transactions. Losing €1,000,000 is a disaster, losing €0.01 is not. Insurance costs for large payments such as infrastructure installments can be as high as 40% in some Latin-American countries. For small payments a user could be scared away from the purchase if the payment system is too complex. For large payments the transaction itself is so important that any difficulties involved when joining the payment system are relatively unimportant. It is not worth joining a new payment system just to make one single payment; it is only worth it if the same system can be used in many different situations. Large transactions are less frequent and more important; hence it might be worth to join a payment system for the purpose of just being able to pay one merchant. A fixed transaction cost of €0.5 is very significant for a €1 payment, but insignificant for a €1,000 payment. A transaction cost of 10% will not amount to so much money for a €1 payment, but will be quite expensive for a €1,000 payment. A merchant is more likely to accept giving €1 in credit than giving €1,000 in credit. However with large volumes the credit risk would become significant for micropayments as well. Losing €1,000,000 is a disaster, losing €0.01 is not. This is important for all payment amounts. For small payment amounts, it is important that the currency contains small enough denominations. For large payment amounts, it is important that the currency contains large enough denominations. The personal integrity issues are roughly the same for small and large payments. Most people make small payments relatively often and large payments relatively seldom. Delays in payment system transaction handling would hence add up more for the small payments than for the large ones. Large payments must be cleared fast since the potential interest earnings for large amounts of money are significant. If the merchant could receive his €1,000,000 today instead of next week that will make a big difference. However if the payment amount is €1 it won’t matter much. Of course, with large transaction volumes the small payments would add up and make the potential interest earnings large again. As the table above illustrates, small payments don’t prioritize the same characteristics as large payments. The table below summarizes my hypothesis about which characteristics are particularly important for micropayments as opposed to larger payments. Chapter 7 What could micropayments be used for? Imagine that you have an Internet micropayment system installed on your computer. Whenever you come across Internet content that costs money, a small window pops up asking if you agree to pay a certain amount of money. Pressing “pay” will cause the corresponding payment amount to be added to the monthly bill from your Internet service provider. If the user gets tired of payment windows popping up all the time this can be extended with configurable rules. In which types of situations would this type of system be useful? This chapter lists some examples of products and services that I believe would benefit from this type of micropayment system. People are willing to pay for physical newspapers and magazines but tend to be less willing to pay for the same kind of content on the Internet. One reason for this has been the fact that most online magazines have been free. This is changing now as more and more online magazines find it difficult to survive on banners and must start charging their users. The number of readers of a magazine decreases drastically when the magazine starts requiring users to register. However if a pervasive micropayment solution such as the one described above was installed on the user’s computer, and payments could be done with a single click, I believe many users would find it is worth paying for example €0.05 to view an article. A micropayment solution could be used to charge €0.01 to listen to a song directly online or €1 to download it. Independent software developers could charge small amounts of money for their software components. Today most software is either free or costs more than €3. A micropayment solution would make it possible to charge for example €0.1 and thereby hopefully find more buyers. An online car game might charge €0.1 for a new set of tires, or a multiplayer boxing game might charge €0.05 per match. Gambling and betting games are strong candidates for these types of payment solutions. Email is usually free but people would probably be willing to pay for services such as sending fax, paper invoices, physical postcards, or SMS. It is possible to charge for services such as stock price alerts or weather alerts sent to a cell phone while sailing. These could be initiated through the Internet in which case the proposed micropayment solution could be used. Chapter 8 How is success defined? First of all it is important not to mix up payment system characteristics with level of success, since most of these are orthogonal. Bad payment solutions can succeed and good payment solutions can fail. If payment solution A has very many users and solution B has very few users it is tempting to conclude that solution A is more successful. But what if the users of A are unwilling, dissatisfied users, while the users of B are extremely satisfied? Which is more successful, the solution that most people use or the solution that most people like? What if we have a solution C with very few users but extremely high transaction volumes – which is most successful now, the solution with most users, most satisfied users, or most transactions? This report is intended to be helpful to companies that plan to create or use payment systems. I will assume that such companies would consider a payment solution that generates a large number of transactions to be more successful than a payment solution that doesn’t – regardless of the actual satisfaction of the buyers. Thus in this report I will use transaction volume to define the level of success of a payment solution. Since information about transaction volumes is not always available I will also consider the number of active users, i.e. users that use a payment system at least once per month. There are many existing payment solutions. During this project I have compiled a database of over 120 payment solutions and I believe there are many more. Since many are similar in nature I have grouped them into categories. For each category I will describe the payment process using a diagram, discuss the advantages and disadvantages, and provide a sampling of existing payment solutions that fit into that category. Some payment systems are based on aggregating other ones; these are added under the category “mixed payment solutions”. An electronic check is a digital token that lets a person withdraw money from another person’s bank account at a later date. It is the digital equivalence of a physical bank check. When a buyer gives a check to a merchant, the merchant does not receive any money until he goes to the bank and cashes the check. At that time the check might turn out to be worthless if the buyer doesn’t have the necessary funds in his bank account. A1. The buyer authenticates himself to the bank and asks for a check for a specific amount of money to a specific merchant. The merchant identity is often represented as an email address. A2. The user sends the check to the merchant. In many cases the bank (i.e. the payment provider) does this automatically. The merchant receives an email saying that he has money to collect and provides information on how to collect it, typically a web address that includes check-related codes. B1. The merchant authenticates himself to the buyer’s bank and presents the electronic check. This is usually done by clicking on a web link inside an email and then entering a password to authenticate himself. If the merchant was not already a member of that bank he may have to become a member now. B2. The buyer’s bank transfers the money to the merchant’s bank account. In some cases the merchant must have an account in the same bank as the buyer, in other cases the buyer’s bank can transfer funds to another bank. This process may seem unnecessarily complex - why doesn’t the buyer transfer funds directly to the merchant’s account in the first place? Sending a check instead of making a direct payment is easier for the buyer because he can ignore details about how the payment should be handled and doesn’t need to know details about the merchant’s bank or account number. The payment is essentially made offline. Buyer does not need to know where the merchant wants the money. Payments can be made to a merchant who is not yet a member of the same payment system as the buyer. The buyer is not required to trust the merchant. More complex for the merchant. Instead of just receiving the money, he has to receive a check and then cash it. Merchant is not sure that the check is valid until he tries to cash it. PayPal is a virtual bank, i.e. a company that for all practical purposes is acting as a bank but legally speaking is not. The definition of what is and what isn’t a bank is becoming more and more blurry as companies like PayPal test the limits. In fact, FDIC (Federal Deposit Insurance Corporation) may yet decide that PayPal is acting as an unauthorized bank. PayPal allows users to deposit and withdraw funds and make payments through email. Payments are initiated through PayPal’s website. However, instead of transferring the money directly to the merchant’s account, an email is sent to the merchant. The email acts like a check, i.e. the merchant must “cash” the check in order to receive the money. This is done by logging in to PayPal’s website and entering authorization information that is in the email. A large number of ways of paying and receiving money are provided by PayPal – you could store money on a PayPal account or you could connect your PayPal account to external bank accounts or credit cards, you could send requests for money via email which essentially works like an electronic invoice, and you could invest the money in your PayPal account in a fund to earn interest. PayPal even provides their own ATM-compatible debit card. PayPal is oriented towards person-to-person payments rather than buyer-to-merchant payments. As opposed to many other payment systems PayPal lets you send money to people that are not PayPal members – however the recipient must become a PayPal member in order to receive the money. PayPal is free for personal use while merchants have to pay a fee when receiving payments. Personal accounts cannot receive credit card payments. The fee for business accounts is USD0.30 per transaction plus 0.7% to 2.9% depending on the transaction volumes and how closely affiliated with PayPal the business is. User and businesses outside of the US can use the service but will be subject to higher fees, more complex registration procedures, and more limitations. PayDirect is a service offered by Yahoo which allows payments similar to the PayPal model, i.e. sending electronic checks by email. Works only in the US. Complex and slow registration process that includes waiting for a physical letter to verify that your address is correct. No way to earn interest on money in PayDirect accounts. Cannot transfer funds from PayDirect account to credit card account. Slow at transferring money to checking accounts (approximately one week, compared to three days for PayPal). PayDirect has tried to charge money for all transactions but around mid-2002 they changed to a pricing model similar to PayPal, i.e. free for personal accounts that can’t receive credit card payments. The fee for professional accounts is USD0.30 per transaction plus 2.2% to 2.5% depending on transaction volumes. In this type of payment solution both the buyer and merchant have a bank account, and the buyer asks his bank to transfer money to the merchant’s bank. The banks can be real or virtual. The merchant asks the buyer to pay. If the buyer is making an online purchase the merchant can in many cases redirect the user’s web browser to an Internet bank, complete with all the purchase request details (price, merchant’s account number, etc). Note that step 1 is not strictly necessary, the buyer could in most cases initiate payments on his own without waiting for a request from a merchant. The buyer authenticates himself to his bank and authorizes the payment. The buyer’s bank transfers the money to the merchant’s bank. The buyer’s bank notifies the merchant that the payment was successful. Secure, usually the buyer’s bank can send a confirmation to the merchant that the funds existed and will be transferred. The buyer and merchant do not need to trust each other – they both use the buyer’s bank as a trusted third party. No offline payments, i.e. both buyer and merchant must be connected to the bank at the same time. SEB is a Swedish Internet bank that provides buyer-initiated bank transfers. To make a payment the merchant redirects the user to the bank’s web-server with information about the payment. The user is presented with a login screen with a request for a digital signature. Using a small physical device called a digipass he generates a digital signature and logs in. He is then presented with information about the payment and asked to authorize it. Authorization is done by generating a second digital signature using his digipass. When the payment has been authorized he is redirected back to the merchant’s website together with a digitally signed payment confirmation which proves to the merchant that the payment was successfully initiated. For more information about the SEB payment solution see chapter 5.3.1. The cost for the buyer is €13 per year for access to the service, while transactions are free of charge. Merchants pay a startup fee of €220, a monthly fee of €22 per month, and a transaction fee of €0.7. The interest rate for money stored in a standard SEB account is 0.1%, or 0.85% if the account holds more than €10100. Ebank, founded in January 2000, is a Japanese bank focusing on small and frequent Internet payments. As opposed to many other banks, Ebank's revenue model is not primarily based on having customers with large accounts – it is based on earning money from frequent Internet transactions. Furthermore Ebank has chosen not to provide some types of services that otherwise are common for banks, for example debit cards and transfers to other banks. Ebank was originally intended to run on Ericsson’s Jalda payment platform but they have instead developed their own payment platform, due to the cost and complexity of integrating with Jalda. The registration process for new customers is inconvenient because Japanese banking laws require bank customers to send in identification papers and a photograph. Once that is complete, however, the payment process is as simple as most other Internet banks. Since mobile Internet is very widespread in Japan Ebank aims to be the leading bank for payments through cellular phones. Buyers using Ebank are not subject to any costs and the interest rate of 0.1% is high by Japanese standards. Merchants must pay a one time setup fee of €250 and a transaction fee of 3.8%, with a minimum fee of €0.25 per transaction. Beenz.com was a company that provided a virtual currency called Beenz. It was similar to an Internet bank except that the currency, Beenz, was not a real currency in any legal sense. Beenz was founded in 1998 and closed down in august 2001. 1 Beenz corresponded to USD0.01 and could be purchased from beenz.com at that rate. The process of purchasing Beenz was done using credit card. Once a user had created an account and purchased (or earned) some Beenz, he could purchase goods and services from any merchant who accepted Beenz. The merchant could then sell them back to beenz.com at the rate of USD0.005 per Beenz. Thus the transaction cost for the merchant was effectively 50% (unless the merchant spent the Beenz on other merchants), making this one of the most expensive payments solutions available. E-gold works just like Internet banks such as SEB – users create E-gold accounts, store money in them, and spend money with merchants that accept e-gold. The difference is that the currency used is gold and other precious metals, so a user’s account might contain 30 grams of gold and 45 grams of silver. The money in the account is backed by real gold stored in safe repositories in Dubai, Zurich, and London and certified by London Bullion Market Association. There is no cost when setting up an account. For each transaction the buyer pays 1% of the transaction amount, with a minimum fee of 0.000004 troy ounces of e-metal (corresponds to €0.001) and maximum fee of €0.5. In addition a storage fee of 1% per year is charged based on how much is in the account. This is essentially a negative interest rate. PayBox, founded in Germany in 1999, is a mobile payment solution. Although the authentication process is very different from internet-based payment solution such as PayPal and SEB it is still a user-authorized bank transfer. PayBox itself does not act as a bank, i.e. the company does not store any bank accounts. Instead the buyer gives PayBox long-term permission to access his existing bank account. The exact mechanism for this varies for each country, in Sweden this is done using a system called Autogiro, which many Swedes use to simplify payment of monthly bills to trusted merchants. The merchant’s server connects PayBox server to request a payment. PayBox server calls the buyer’s mobile phone, describes the purchase that is being authorized, and asks the user to enter his pin code. The user enters his pin code and hangs up. PayBox server initiates a bank transfer and notifies the merchant that the payment was successfully initiated. After a day or so the money is transferred from the buyer’s bank account to the merchant’s bank account. In Sweden merchants using PayBox pay a one time setup fee of €550, a yearly fee of €88, and transaction fee of 3%. In addition merchants must pay the bank a fixed transaction fee of €0.2. Users pay a yearly fee of €21. Paynova is a young Swedish company that provides a server-side wallet solution. To use Paynova the buyer must first create an account and deposit money into it. This is free of charge as long as the user deposits more than €11. When logged into the account the user sees a photo-realistic picture of a wallet complete with credit cards, cash, and receipts. This wallet can be used to make purchases from merchants that have signed up with Paynova. Paynova is in most respects equivalent to a bank – the user deposits money into his Paynova account (the “wallet”) and can choose when and how to deposit, transfer, or withdraw funds. The main difference is that Paynova does not pay any interest. Paynova is oriented towards micropayments and can handle payments as small as €0.1. Mint is a mobile payment solution that was started in early 2000. It is similar to Paynova and other server-side wallets in that the user can open an account and pre-deposit money into it. When making purchases with Mint the buyer dials a merchant-specific phone number and authorizes a payment. Depending on the configuration and the amount to be paid the buyer may or may not be asked to enter a pin code. When the purchase has been authorized Mint will credit the merchant and deduct the buyer. Mint does not require the user to pre-deposit money. Users who pass a credit check can receive a monthly bill instead, or have money automatically withdrawn from their bank account in conjunction with purchases. Although Mint was originally intended to replace cash and credit card as a payment solution in physical stores, it is mostly widely used as a payment solution for parking fees. When a Mint-registered person parks his car in Stockholm he does not need to seek out the parking machine, instead he just calls a specific number using his mobile phone and uses a simple touch-tone menu to indicate which type of parking zone he is in (they are divided into cost categories). The exact location of the car does not need to be reported. Furthermore, the user does not need to try to guess how long he will park (which is often the case when paying using physical cash), instead he simply calls again when he wants his parking permit to end. A small sticker is used to tell the parking attendant that Mint is being used to pay for the parking. The parking attendant uses his own phone to verify that the car is currently “logged in” to the given parking zone. The cost for the buyer is €0.5 per usage. Merchant-initiated bank transfers are similar to user-initiated bank transfers. The difference is that in merchant-initiated bank transfers the buyer’s involvement is not required when making a payment, as long as the merchant has the buyer’s account information. Usually the merchant asks the buyer to provide this information. Once that is done, however, the merchant can make any number of withdrawals at any date. There is no way for a buyer to control which merchants are allowed to withdraw money, how much, and when. It is important for the merchant to convince the buyer that the account information will be treated confidentially and that he will only be deducted for that one purchase. The buyer gives his account number to the merchant. Other information might be required as well, for example account holder name or expiry date. This step is only required if the merchant doesn’t already have the information. The merchant contacts his bank and requests a withdrawal from the given account number. The merchant’s bank contacts the buyer’s bank to withdraw the money. The diagram is a simplified view of the payment model, each individual payment system has its own exact payment and clearing process which may add complexities such as offline clearing, validation processes, etc. Simple. For repeated payments such as subscriptions the buyer only needs to give account information to the merchant once. Only the merchant needs to connect to the bank. High level of trust needed between buyer and merchant, since the merchant is entrusted to store account information. Insecure. The buyer has little control over who can access his account and how much is withdrawn. Visa and MasterCard are the two most commonly used payment schemes based on account numbers. They appeared in the early 1960s and now have over 1.3 billion users and $2.3 trillion of sales each year. I will refer to these collectively as credit card solutions. For credit card solutions it is strictly speaking not the account number that is being used when making payments – it is the credit card number. Since the credit card number is associated with a bank account it can be treated as an account number. The term credit card has become a misnomer because credit card payments can be made without the involvement of a physical card, and without the involvement of credit. Neither Visa nor MasterCard require any authentication process for the buyer in conjunction with purchases. This means that anyone who gets a hold of somebody’s credit card number, name, and expiration date can make payments and purchases on that person’s behalf. See chapter 5.3.1 for further discussion on credit card security. Make sure nobody can eavesdrop when the user sends his credit card number to a merchant. SSL is often used to create a secure information channel between a buyer’s web browser and a merchant. Store the credit card number with a trusted third party who can act as an intermediary when making purchases. SET (“Secure Electronic Transaction”) is an open-network payment-card protocol that provides this type of solution. Microsoft Wallet is also a solution designed to protect credit card information using a trusted third party (MSN in this case). Virtual credit cards, i.e. temporary credit cards numbers that are issued for a specific purchase. This type of solution is provided by Moneta Online in Italy. These security mechanisms are weak because all forms of protection become useless if one single dishonest merchant decides to release the buyer’s credit card information. The credit card fees for merchants and users vary depending on which banks are used. The typical transaction cost for merchants is 1.5% to 4% of the purchase amount plus a fixed transaction cost of €0.2 to €0.5. In addition there are usually monthly fees, one-time setup fees, and other fixed costs. In this type of payment solution the buyer pays money to one specific merchant upfront, who maintains an account on behalf of that buyer. The account is deducted every time the buyer makes a purchase or utilizes a service from that merchant. Some merchants use this as a form of loyalty scheme by offering a high interest rate on deposited money. This type of payment aggregation reduces overhead cost associated with payments. The buyer makes one single payment upfront and can then make multiple smaller purchases at later dates. A1. The buyer pays money into the merchant’s bank account using any kind of payment mechanism. A2. The merchant creates a local account to keep track of the prepaid balance for that user. This has nothing to do with the real bank account of the merchant; it is just a virtual account to keep track of how much the buyer has consumed. B1. The buyer makes a purchase from the merchant. B2. The merchant deducts the cost of the service from the user’s prepaid account. Note that this is not a transaction with real money, i.e. the merchant’s bank account is not involved. In this type of solution the merchant is essentially acting as its own virtual bank. The user “deposits” money, which can only be spent with that merchant. In some cases it is not even possible to withdraw the money. Less real payments means less overhead cost for payment processing. Merchant does not have to take any credit risks. Purchase processing is simple; the merchant does not have to interact with any external payment systems or accounts. No real money moves anywhere during a purchase. The user must trust the merchant or he will hesitate to deposit money. The user has no real control over when the merchant deducts his account and how much. User’s money is locked in with one merchant and can (in many cases) only be spent with that merchant. The merchant earns interest on the user’s deposit (unless the merchant pays interest back to the user). The user might not be able to withdraw the money if he wants to stop using the service. AT&T provides a service where users can purchase Internet access on a prepaid basis. The user pays €10 for a specific number of minutes of Internet access. When connected to the Internet AT&T will deduct the user’s prepaid account for each minute online. A similar solution is provided by Swedish telecom operators, where users can purchase prepaid codes used to pay for mobile phone airtime. However those prepaid accounts can be used for services provided by third parties. Since the money is not locked with any specific merchant I don’t classify this is a prepaid merchant account solution. ICA Kort is a loyalty program and payment scheme provided by ICA, a major food retailer chain in Sweden. Members receive a payment card (a magnetic stripe card) and are invited to deposit money into their ICA account. When making purchases, the customer swipes his card at the cashier and enters a PIN code. The money is then deducted directly from his ICA account. The advantage to the user is that he gets better interest rate than most Swedish banks (3.6%). He also receives loyalty bonus points that translate into future price discounts. The advantage to ICA is that the customers are more loyal and that payment processing for ICA cards is cheaper than credit card payments. Another way to implement a prepaid model is for the merchant to generate payment codes, which is a form of currency that is only valid for a specific merchant. Instead of using accounts to keep track of how much each user has deposited, the merchant sells payment codes to buyers. The payment codes can then be used at a later date to make purchases. A1. The buyer purchases three payment codes using any payment mechanism. A2. The merchant marks those codes as sold, to avoid selling the same codes to another buyer. B1. The buyer purchases a service and uses payment code 10250 as currency. B2. The merchant marks payment code 10250 as consumed, so that it can’t be used again. This is similar to a virtual currency, especially if the merchant prints payment codes on bills and distributes them. However it is not a virtual currency because each bill can only be spent once, after that it is worthless. For security reasons the physical payment code distribution is often done using scratch cards. Once the card has been scratched and the payment code revealed it is difficult to hide the fact that the payment code has been used. The prepaid voucher model is used by many telecom operators, for example the Swedish operators Telia, Comviq, Vodafone, and virtual operators such as Tango and D-juice. Merchant does not need to keep track of personal user accounts. A large distribution network can be used to sell prepaid codes, which means people can buy from the merchant without coming into direct contain from the merchant. No credit risk for the merchant. Many purchased prepaid codes will remain unused, in which case the merchant has received a payment for nothing. Risk of fraud, for example the person using a payment code isn’t the one that bought it. Distribution of prepaid codes is a security risk, since a prepaid code must be treated as consumed as soon as anybody has seen it. Inconvenient and error-prone for users to deal with long codes. The three telecom operators Comviq, Telia, and Vodafone each provide a prepaid merchant voucher system in Sweden. The user obtains a prepaid voucher by walking into any associated retail store and purchasing a scratch card, or through corresponding web-based services provided by companies such as Goyada. To use the voucher the user dials his operator and enters the prepaid code. After this the operator will give the user a specific number of minutes of airtime. Each card contains a unique 15-digit code. A person who possesses such a card could go to an associated public Internet terminal, enter the code, and receive 2 hours of Internet access. However the code cannot be used for any other purposes. In this type payment solution the buyer is invoiced for his purchases at a later date. When and how the invoicing is done varies, for example after each purchase (impossible for micropayments), once per month, after a certain debt threshold has been reached, etc. This process is summarized in the diagram below. A1. The buyer makes a purchase. A2. The merchant adds the cost of the purchase to the buyer’s debt. B1. The merchant sends an invoice to the buyer for his accumulated purchases. B2. The buyer pays the invoice. B3. The merchant reduces the buyer’s debt by the corresponding amount. Payments can be aggregated into periodic invoices. Little or no technical integration required. Buyer does not need to join any particular payment scheme; he just needs to provide an invoicing address. Merchant must take significant credit risks. Usually requires significant manual administration. Payment clearing takes a long time. Since invoicing is such a common payment model I will not describe any concrete examples. Payment relationship sharing is when one merchant has an existing payment relationship with a set of buyers and provides a mechanism through which other merchants can receive payments through the same relationship. Many companies such as telecom operators, internet service providers, and power companies have existing payment relationships with large sets of users, for example through a monthly invoice. Let’s say merchant X is such a company and merchant Y is company that does not have any billing relationships at all. Merchant Y can sell services to the customers of merchant X and “ask” merchant X to deduct the users for that. This way merchant Y can get away with having only one billing relationship (with merchant X) instead of thousands or millions. Merchant Y reports the purchase to merchant X. Merchant X executes the payment. The mechanism for this depends on which type of payment relationship merchant X has with the buyer. If it is an invoicing relationship, for example, merchant X would add this purchase to the user’s monthly invoice. Merchant X pays merchant Y, either online or offline at a later date. To minimize the amount of integration required merchant Y could ask the user to execute the payment himself, for example by sending a premium SMS to merchant X. 2. Merchant Y asks the user to pay merchant X, for example by instructing the user to send a premium rate SMS or connect to a specific web address. 3. The user pays merchant X using whatever mechanism was provided by merchant X. 4. Merchant X pays merchant Y, either online or offline at a later date. This type of payment solution is similar to buyer-initiated and merchant-initiated bank transfers. The difference is that in this case merchant X is not a bank, i.e. merchant X does not store the buyer’s money. Neither the buyer nor the merchant needs to set up a new payment relationship. The merchant can benefit from an existing trust relationship between the buyer and another merchant. Merchants with existing payment relationships can increase their revenues by sharing the payment relationship with other merchants. Unclear responsibilities in some cases, since the buyer is not paying to the same company that he is purchasing from. Requires complex technical integration in some cases. This solution is offered by many telecom operators in Europe, for example the Swedish telecom operator Telia. Telia has a monthly invoicing relationship with millions of users in Sweden. A merchant can purchase a phone number from Telia worth for example €1. Every time a user sends an SMS to that number €1 will be added to that user’s phone bill and the telecom operator will pass through a subset of that money to the merchant. The merchant can now sell products and services to users and have them pay by simply sending an SMS. In many cases the merchant’s premium SMS phone number is associated with a fixed price, for example €1. In some cases, however, the merchant can control how much is to be deducted separately for each purchase, which offers more flexibility. The average revenue split for a premium rate SMS message of €1.00 gives the mobile operator €0.40, the broadcaster / production company €0.25 and the solutions provider €0.15. The remaining €0.20 covers taxes. This is similar to the premium rate SMS solution, except that the payment is made by calling a phone number instead of sending an SMS. The amount to be deducted might be fixed, it might depend on user interaction during the phone call, or it might depend on the length of the phone call. This payment model as well as premium rate SMS is used by many merchants in Sweden that provide custom ring tones and logotypes for cellular phones. A premium rate phone call model is used in a partnership between Coca Cola and Telstra Mobiles to provide the service dial-a-coke. This service allows users to purchase a drink from a vending machine by dialing a premium rate phone number, thus having the drink deducted on the phone bill. i-mode is a service offered by the Japanese telecom operator NTT DoCoMo that essentially turns the mobile phone into a web browser. Most web pages on the Internet are written in HTML but NTT DoCoMo has invented a subset of this called CHTML (“compact hypertext markup language”), which is optimized for low bandwidth and small screens. Most i-mode services are written using CHTML but this is not a strict requirement. HTML pages can be displayed as well, but may look incorrect if they contain tags that are not included in the CHTML subset. Users are charged for the amount of traffic sent to the phone, in the same way the European telecom operators charge for WAP traffic over GPRS. As opposed to most telecom operators offering WAP and GPRS services, however, DoCoMo has also provided a payment solution for i-mode. Any content provider can, if approved by DoCoMo, provide content to i-mode users and charge subscription fees. The payment model for third party content providers is quite simple and straightforward – the content provider can charge 100, 200, or 300 yen (i.e. €0.8, €1.6, or €2.4) per month for a service, and DoCoMo retains 9% of this. Thus the content provider can earn at most €2.2 per month per service per subscriber. i-mode includes a simple interface in the mobile phone through which users can add or remove subscriptions. The monthly payments are added to the user’s phone bill. Thus the billing relationship that NTT DoCoMo has with its users is shared with content providers. When a user becomes a C-mode customer he receives a virtual membership card in the form of a two-dimensional barcode image stored on his mobile phone. 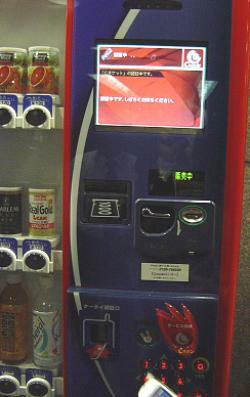 The user identifies himself to a vending machine by placing his phone next to a small optical reader (see the bottom of the picture above). The user can then buy a drink the “normal” way (i.e. placing coins in the slot) and receive C-mode “points”, a loyalty program intended to increase the sales of drinks in vending machines. The C-mode points can be spent on a wide range of services, including services such as a physical maps and coupons (printed directly on the vending machines printer). Third party vendors can sell services to users and accept C-mode points as payment, thus C-mode allows merchants to share the payment relationship between a user and vending machine. The vending machine acts like a deposit box for a C-mode account. Physical cash payments are made by handing physical tokens to a merchant. This is described in more detail in chapter 5.2.1. Each currency (US dollar, Euro, Yen, etc) is essentially a payment system. Since these payment systems are virtually identical in nature I will not analyze them further. Electronic cash payment systems are based on users and merchants carrying around their money in much the same way as physical cash, as opposed to storing money in centralized locations such as bank accounts. The nature of electronic cash is discussed in chapter 5.2.2. Electronic cash is often stored as digital data on a memory chip controlled by a small processor embedded on a plastic card. Such cards are commonly known as “smart cards” since they, as opposed to magnetic stripe cards, can do more than just store information. The picture below shows two cards. The left is a magnetic stripe card; to the right is a processor card (a.k.a. “smart card”). Both types of cards can store information, but only the processor card can protect the information it holds. The processor itself is embedded in the golden rectangle under the text S|E|B. A payment using electronic cash is typically carried out by deducting one cash card and crediting another cash card, just like with bank accounts. Unlike bank accounts, however, it is possible for the owner to physically access and manipulate his cash card. So what happens if I have a cash card with €10, make a payment of €1, and then programmatically access my cash card and add €1 again? Or what happens if I tamper with the payment terminal to “catch” the €1 as it is being paid, so that I can duplicate the operation later and thereby spend the same €1 again? These are the types of issues that electronic cash payment systems must deal with. Generally speaking the solution will be either centralized or decentralized. In a centralized solution each digital “coin” has a unique identity and a centralized database provided by the coin issuer keeps track of which electronic coins have been issued and spent. This makes it difficult to double-spend, but requires that the central database be checked and updated for every single transaction. Furthermore, since each coin can only be spent once, new coins must be created after each purchase. This type of solution is in most cases not feasible for micropayments as the cost of connecting to a centralized server and minting new coins may very well exceed the price of the purchase in the first place. The buyer makes a purchase. The merchant asks the buyer to pay. The buyer puts his cash card in a payment terminal and enters the amount to be paid. The payment terminal communicates with the payment card and asks it to deduct the given amount of money. The payment terminal sends the electronic coins to the merchant’s payment terminal. The merchant’s terminal checks who issued the coins (for example a bank), connects to the issuer, and asks for a verification of the coins. The electronic cash issuer looks at the serial number of each individual coin being paid, compares against a database of all issued coins, and makes sure those coins have not already been spent earlier. The electronic cash issuer marks the given coins as spent. The electronic cash issuer generates new coins of the corresponding amount and sends to the merchant’s terminal. The merchant’s terminal adds the given coins to the merchant’s cash card. In a decentralized solution cryptographic techniques are used instead of a centralized database. This is more complex and less secure but will significantly increase the performance of the system since no connection has to be made to a third party for each purchase and the same coins can sometimes be reused. Millicent is a decentralized micropayment system that was developed by Digital Equipment Corp in 1995. The original goal was to find a way for online magazines and newspapers to be able to sell access to online content. Millicent is centered around a concept named “scrip”. Scrip is a form of digital cash represented as numbers. Each merchant who wants to accept Millicent payments must generate their own scrip using tools provided by Millicent. In order for a user to make purchases from a merchant he must obtain enough scrip from that particular merchant. This is simplified through the use of brokers. A broker is like a merchant who sells scrip on behalf of other merchants. Each user is associated with a broker. When a user enters the Millicent system he can purchase “broker scrip” from his broker. This is a form of merchant-independent scrip, i.e. the electronic money is tied to the broker but not tied to any specific merchant. When the user wants to purchase a product from a merchant he needs to obtain scrip for that particular merchant. This is done via the broker, i.e. the user purchases merchant scrip from his broker, thus exchanging broker scrip for merchant-specific scrip, which can then be used to make the purchase. Scrip is like a bill. It includes information about the value of the scrip and who issued it. It also includes an expiry date, an electronic signature, and other security-related information. All this is encoded within a single long number. When you make a payment that is smaller than the value of the bill you receive “change” in the form a new, smaller bill. Let’s say a user owns a piece of broker scrip worth €1, and he now wishes to read a €0.05 article from a merchant. First he needs to purchase merchant-specific scrip, so he sends his €1 broker scrip to the broker and receives two pieces of scrip in return – a merchant-specific €0.05 scrip, and change in the form of a €0.95 broker scrip. The user can then purchase access to the article using his €0.05 merchant scrip. Since the merchant was the one who issued the €0.05 scrip in the first place he can verify its authenticity without needing to communicate with an external system. This may sound complex but the user does not need to handle the process manually. Instead the user installs Millicent software that acts on the behalf of the user when he is making payments. All the user has to do is authorize payments and set up payment rules. Millicent is designed primarily to handle payments in the range €0.001 to €5. Digicash, founded in 1994, developed a payment system called Ecash that was intended to provide fully anonymous secure electronic cash for Internet use. Ecash, like Millicent, is represented as digits stored locally on a user’s computer. Unlike Millicent, however, Ecash is a centralized solution. When a buyer pays a merchant using Ecash, the merchant must connect to the Ecash issuer to verify that the money has not already been spent elsewhere. Thus the buyer and the merchant must have access to the same Ecash issuer (typically a bank). One of the central features of Ecash is anonymity. Using a cryptographic technique known as blind signature a user can purchase Ecash from a bank without revealing his identity, thus Ecash users can be fully anonymous. This type of strong personal integrity has an adverse side in that it makes it easier for criminals to launder money, receive ransom payments without getting caught by the police, etc. Payments as small as €0.01 are possible using Ecash, but due to the overhead of the centralized architecture large numbers of such payments are not really economically feasible. Mondex is an electronic cash system based on processor cards. It was developed in 1990 by NatWest, a major U.K. banking corporation. In 1997 Mondex became a subsidiary of MasterCard International. Mondex is a decentralized solution, i.e. a user can pay money to a merchant without involving a third party such as a bank. Both the user’s card and the merchant’s card maintain a short transaction history, which increases the security at the cost of personal integrity and anonymity. MasterCard issues credit cards that include a Mondex chip. The chip can be loaded with digital cash using an ATM. A suit of devices are provided to support functionality such as checking the balance on a card, transferring money from one card to another, locking a card so that a potential thief can’t use the card if it is stolen, etc. In 1996 an electronic cash card payment system was initiated by several Swedish banks under the slightly misleading name “Cash”. The underlying protocol and technology is based on Proton, a system that was provided by Banksys, a software company owned by Belgian banks. Owners of these cards can load them with money using small terminals that are available in many locations such as retail stores and bank teller machines. The terminals allow the user to transfer money from a bank account to the card, which can store up to €165. When the user wants to make a purchase using his cash card, he places his card inside a small terminal at the cashier of a store. The clerk has a terminal of his own in which he enters the amount to be paid. The user presses a button to confirm the payment, in which case money is transferred from his card to the merchant’s card terminal. At the end of the day the merchant transfers the money to his bank account through a dialup connection. This is a decentralized electronic cash system; no centralized bank must be involved in the purchase. Many companies provide payment systems that aggregate or simplify access to other payment systems. This is useful for merchants who don’t want to be locked in with one payment system, who want access to many payment systems at the same time, or who find a particular payment scheme too complex and want another company to act as an intermediary to provide a simpler interface. YadaPayment is a payment suite provided by the Swedish company Goyada. YadaPayment allows merchants to access a number of payment schemes in a simple unified way. This includes Internet bank payments, premium SMS, and premium phone calls. For example if a merchant wants to accept premium SMS payments that are accessible to all users in Sweden he would have to set up agreements with all three telecom operators in Sweden and integrate separately with each one. Using YadaPayment the merchant only has to set up one agreement and integrate with one technical system. Debitech is a Swedish company that provides access to a wide range of payment-related services such as Internet bank payments, credit card payments, invoicing services, and loyalty card services. What are, then, the most critical factors influencing the success or failure of a micropayment system? In this chapter I will highlight certain payment solutions that I see as interesting examples of success or failure, weigh in the opinions and experiences of people that I have interviewed, and attempt to identify the causes of success or failure. i-mode was launched in February 1999 and by April 2002 there were over 32 million subscribers in Japan and over 3000 available services. Other Japanese telecom operators have achieved comparable success with their similar competing services EZ-web (8.7 million subscribers), H-Link (1.5 million), and J-sky (8.8 million). Take a subway ride in Tokyo and you will find a large proportion of the people in the train car staring at their phones, emailing, reading news, playing games, etc. NTT DoCoMo already had a telecom network covering the whole population of Japan and had billing relationships in place with all these people. More importantly, DoCoMo was willing to share this payment relationship with independent content providers. It is simple for the buyer to pay. Using his phone the buyer browses to a site and, when he tries to access a pay service, he is asked if he wants to subscribe. One button-click later the subscription is complete and the cost will be added to the buyer’s phone bill each month. Subscription model instead of pay-per-view model results in stronger loyalty. The buyer does not have to actively pay each time he uses the service, only once to start the subscription. His cost for using the service is not really noticeable since it is hidden as a relatively cheap item in the phone bill. Simple economic model. Very few pricing options are available to merchants, which makes the technical integration easier. Merchants do not have to set up billing relationships with users – this is all done by NTT DoCoMo. Many potential security issues have been eliminated by only making it possible to purchase products that are consumable via the mobile phone. If it were possible to purchase physical goods using the i-mode payment system then it would be possible for a criminal to “borrow” somebody’s mobile phone to make a payment. i-mode can only be used to purchase content that is consumed on the phone. It is not possible to use i-mode to pay for a drink in a vending machine, or to pay for an Internet magazine. Content providers must go through a complex and time-consuming validation procedure before being allowed to provide premium i-mode services through the official i-mode menu. There are many controversies surrounding PayPal, including lawsuits and anti-PayPal websites, but the usage figures tell an undeniable success story. PayPal was launched in 1999. By June 2001 they processed an average of 165000 payments per day totaling USD 8.2 million. By august 2001 there were over 15,000 websites accepting PayPal payments, constituting over 10% of all Internet traffic in the financial services category. By November 2002 PayPal had over 20 million users, including more than 3 million business accounts. E-bay, with 46 million users worldwide, has announced plans to acquire PayPal. Viral marketing effects. It is possible to send money to a person who is not yet a PayPal member. The recipient will receive an email stating that he has money to collect and that he has to register with PayPal in order to receive the money. There is also a referral bonus system – anyone who puts a PayPal logo on a website will earn USD5 for each person who clicks the logo and signs up as a customer. Free for non-merchants. Other email-based payment solutions such as eMoneyMail (discontinued since July 2002) charge users a fee for each transaction. Person-to-person payments. People who sign up for PayPal can send money to other people as well as merchants. Users are not required to pre-deposit money. It is possible to users to deposit money into their PayPal account, but it is not required. The user could have money drawn from a separate bank account automatically when a payment is made. Ecount, a similar email-based payment solution, is not as appealing since it requires users to deposit money into their account before they can send money. Relatively simple setup process. The user does not have to download any software or sign any papers; it is a pure web-based registration process that only takes a few minutes. Enough customer complaints to warrant at least two dedicated anti-PayPal web sites. The customers complain about bad customer service, bad terms of service, locked accounts, and more. Premium rate SMS payments started appearing in 2001 and have since then become a norm for spontaneous payments in conjunction with TV broadcasts. For example the German television show, 'Jede Sekunde Zählt' (Every Second Counts) invited users to send SMS messages to influence which contestant would win a competition. This call to action generated 1.2 million SMS messages within half an hour. Premium phone call payments have been around longer but many telecom operators are attempting to replace this with premium SMS, probably due to the higher expense of processing phone calls. The advantage of phone calls however is that the user does not need to own a mobile phone and does not need to know how to send SMS. In November 2002 the Swedish television gala “Världens Barn” (Children of the World) raised over €7 million in charity through premium phone calls during the course of the two hour show. Phone-based payment systems are now increasingly being used to pay for Internet content such as games and news. The following factors probably contributed to the success of phone-based payments. No registration required for user, any mobile phone owner with access to a telecom network with premium services could make payments through this medium. Ease of use, the user needs only send an SMS or make a phone call. Virtually all mobile phone owners know how to make a phone call. Many people don’t know how to send SMS, but SMS is still widely used today within Europe with 5 billion messages being sent per month. A Gartner group report in November 2002 indicates that more Europeans use SMS than email. User does not need to be near a computer. For most users that own both a mobile phone and a computer, it is more likely that the mobile phone is on and within reach than the computer. When watching TV, internet-based payment solutions cannot compete since most users do not have computers with Internet access within reach from their favorite TV couch. · The user has little control over how much he will be deducted for an SMS or call - he must trust the merchant. Furthermore there is rarely any easy way for the user to found out how much he was deducted until he looks at his phone bill. · The merchant’s share of the revenue is low compared to other payment solutions. · The user must own a mobile phone. · Low security. No password is required to make the payment, so anybody who picks up somebody else’s phone can make payments on behalf of that person. Mobile phones usually require some kind of pin code during startup, but since few people shut off their phone between calls this isn’t a relevant protection. I believe that the main factor contributing to the success of credit card payment systems is the fact that they were invented by and distributed by banks. Users trust their bank (otherwise they wouldn’t deposit their money there), and it is easier to accept a payment solution from a company that you already know and trust. Banks already had the necessary infrastructure and routines for processing transactions and clearing payments. Credit card payments have been around since the early 1960s, i.e. long before Internet or mobile phones became widely used. Thus the banks could create an Internet interface to existing payment processing systems, as opposed to new payment systems that had to be invented from scratch. Credit cards can be used in both physical stores and Internet stores, and can be used in bank teller machines to obtain physical cash. Through the above advantages credit card payment systems managed to reach critical mass, thus causing the number of merchants and users to continue growing through pure network effects. · Low security – anybody who knows your name, credit card number, and expiry date can access your account, which includes at the very least all merchants you have ever purchased from. Furthermore the information is printed right on the card. · Person to person payments are not possible in any practical way. · Expensive for merchants, especially for small transactions. · Large threshold for both buyers and merchants to join the system. Often requires physical documents to be filled in and sent through mail, physical cards, and validation processes. Between 1999 and 2001, beenz.com raised $89 million in venture funding and established operations in 13 countries. After 18 months of existence there were 5 million Beenz account holders. Despite this apparent success Beenz shut down in August 2001, giving users 10 days notice to spend their Beenz. However by then very few merchants would accept Beenz, since they would not be able to convert the Beenz back to cash. This was a disastrous blow against the credibility of all online payment solutions, the equivalence of a bank that goes bankrupt and takes all customers’ money with them. With such a promising start, why did Beenz fail? According to Charles Cohen, founder of Beenz, the fact that Beenz was designed as a symmetrical payment system spelled its demise. The Beenz currency was supposed to circulate freely and without any friction, however the nearer they come to achieving this the less money they would earn. Someone has to pay for the payment – in the physical cash payment system this is done by banks and taxpayers in conjunction with the production and distribution of physical cash. In credit card payments the merchant pays for the payment. If the payment system provider cannot earn money then the payment system will disappear. Beenz had no affiliation with any financial institution35, which made it difficult to earn long-term trust and credibility. The terms and conditions that user were required to accept did not offer any security. For example the following condition was included: “beenz.com may terminate the Beenz economy at any time. If beenz.com chooses to do so, any Beenz in the Member's account may be invalidated by beenz.com, and the Member will not be entitled to any compensation of any kind for such invalidated Beenz; however, beenz.com may not do so until ten (10) days after beenz.com has posted its decision to terminate the Beenz economy on this web site (or a successor web site), or has otherwise notified the Member.” This effectively means the user must check the Beenz site about once per week or risk losing all his Beenz without notice. As it turned out the user lost their Beenz anyway, since when Beenz did post this notice no merchants would accept Beenz any longer. Users could not convert Beenz to real currencies. Merchants could convert Beenz to real currencies, but the exchange rate of 50% was unreasonably high. Despite heavy investments and marketing efforts the Swedish electronic cash system faded away quite quickly. By February 2001 there were 35,000 payment terminals in Sweden, 5000 load terminals, and 7.7 million electronic cash cards. The payment system was supported by banks, most people had heard of it, and all the necessary infrastructure was in place. This was not enough to ensure success, however. Merchants were not satisfied with the system and started returning the terminals. Buyers who started using the payment cards stopped doing so eventually, and today the system is hardly used at all. The electronic cash card was marketed as an alternative to physical cash and credit cards, and intended to be used in physical stores. Physical stores, however, offer a number of widely accepted competing payment methods such as physical cash and credit cards. The cash card might have succeeded better if marketed as an Internet payment solution. No benefit to users. The banks tried to create a demand artificially, but in the end most users found physical cash and credit cards to be more practical. The electronic cash card did not offer any easy way to see how much money you have, or to transfer money to a friend. Physical cash is accepted by virtually all stores, electronic cash is not. Furthermore there is no easy way to exchange electronic cash into physical cash. No benefit to merchants. Electronic cash does not replace physical cash, so the electronic cash payment system requires additional investments and technical integration in the stores. Expensive. Initially the system was free for both users and merchants, which possibly explains the initial success. However as soon as fees were introduced it became difficult for users and merchants to justify the cost. The banks that initiated the system focused too much on their own needs and too little on the needs of users and merchants. Complex setup procedure for buyer, requiring installation and configuration of specific software in the computer. Once setup is complete the transaction procedure is very simple compared to solutions such as PayPal, but too few users were willing to go through the setup procedure. It is difficult to take your money with you, since the money is stored inside your computer. Lack of partnership with a large trusted party such as a bank or major content provider. Since the solution was never used in large scale, the scalability advantages of having a decentralized solution never quite came to use. One conclusion I have reached is that a payment solution’s likelihood of success increases significantly if it builds upon an existing billing relationship between a company and its users. Most people have several existing billing relationships, typically through monthly bills such as the phone bill, the electricity bill, rent, etc. Many of these represent vendor-specific micropayment solutions that use aggregation to minimize the transaction cost. For example the cost of a short phone call in Sweden is around €0.2, and the monthly phone bill is an aggregation of a large number of such costs. Allowing multiple vendors to share such a payment relationship represents a very practical and cost-effective solution. Another conclusion I have reached is that trust is more important than security, and that many payment solutions have failed because they focused too much on security. Users and merchants are more likely to use an insecure payment system from a trusted company than a secure payment system from an untrusted company. This is supported by many of my interviews as well as the fact that most of the successful payment solutions in use today originated from trusted entities such as banks and telecom operators. Since trust is easier to keep than to earn it is easiest for a payment solution to succeed if it builds upon existing bonds of trust. i-mode and premium SMS are built upon the trust between a user and his telecom operator. VISA and MasterCard are built upon the trust between a user and his bank. PayPal is an interesting exception since their solution is not built upon an existing bond of trust, however their continued success is based on the fact that they have passed the critical level where there are enough users and merchants to make the payment solution appear trustworthy in its own right. There are countless examples of similar payment solutions that have faded away because they failed to reach a critical mass of users and merchants. I believe PayPal succeeded because of a good technical solution, a viral marketing strategy, a strong partner (e-bay), and strong funding. PayPal may well fail in the future, however, because of increasing numbers of complaints from users, but the failure will in that case be caused by lack of trust, not primarily technical or economical reasons. Another conclusion I have reached is that micropayments as low as €0.1 or less are still uncommon. This is possibly explained by the fact that none of the major payment solutions today make it convenient or economical to handle such small payments. There have been many attempts at providing such solutions, for example Millicent, but they have not earned enough trust to succeed on a large scale. Is there, then, really a demand for smaller micropayments? This is a controversial issue and during my interviews I have heard differing opinions on this matter. My personal opinion is that there is a strong demand for micropayments but that it cannot be implemented as a new payment solution – it has to be done via an existing payment solution that already has earned trust. I believe the next logical step for existing payment solution providers will be to provide smaller and smaller payments. This is difficult for older, more expensive infrastructures such as Visa (based on expensive bank systems) and premium SMS (based on expensive telecom systems), due to the high cost of processing transactions. Newer more lightweight infrastructures such as PayPal are more likely to succeed in providing smaller micropayments, but it is still a challenge. To handle small payments effectively the technical overhead for each transaction must be very small. It is therefore most likely that an existing solution focusing specifically on micropayments, such as Millicent, will be integrated with an established solution such as PayPal or Visa. From the user’s perspective the system will be provided by the same trusted partner as usual, but technically speaking it will be a whole new system. My final conclusion is that it is extremely difficult for new payment systems to achieve widespread acceptance, and that any company that wishes to enter this area must have plenty of capital, be willing to wait years before return on investment, establish partnerships with major trusted companies that have existing payment relationships with millions of users (for example banks and telecom operators), implement a technical solution that is fast and easy to use for all parties, and make sure that both merchants and buyers actually benefit from the new payment system. Below is a list of people interviewed for this project, ordered by last name. Assistant manager, Sky Think System Co., Ltd. Managing director, Global Fun AB. Science and Technology Counselor, Science & Technology Office. Customer implementation manager, Paynova AB. Cofounder & Executive vice president, Ebank Corporation. The questions for the interview were adapted specifically to each company, but some questions were used in almost all interviews. What type of company are you? For example a bank, an application service provider, a software development company, a payment system aggregator, a portal, etc. What types of goods and services are people willing to pay for? In which situations today is there most need for a new payment system? Which assumptions did you make in the beginning? Which turned out correct, which turned out wrong? Was the development market-driven or technology-driven? Did you change your approach along the way? If so how? Which of your payment solutions do you think is strongest? Will you design new payment solutions, or focus on one of the ones you have today? Which improvements do you plan? What is the security architecture of your payment system? What is the economic model of your payment system? Who pays who, interest rates, fees, etc. How is your payment solution packaged? How is your payment solution compared to competitor X, Y, and Z? o What is most important to the buyer? o What do the buyers think of your payment system? What are they asking you to improve? o How many and what type of helpdesk cases do you get? o What is most important to the merchant? o What do the merchants think of your payment system? What are they asking you to improve? · What is your current market share? · Which companies do you compete with? What other types of solutions compete with your solution? What other types of solutions could replace yours? · How was the technology obtained? Developed in-house? Outsourced? Licensed? · How is the technical operation handled? · How does the user interface look? · How does payment-clearing work? · What makes a micropayment solution succeed? · Which payment system(s) do you use today? · What were your requirements and constraints before you chose to use this payment system? Which other payment systems did you reject? Why? What is most important for the buyer? What is the economic model of the payment systems you use today? Who pays who, how much, and when? · Are you considering changing to a new payment system? Which one in that case, and why? Which types of improvements would you like to see in your current payment system? What do your buyers think about the payment system you are using? What other types of services would the chosen payment system be suitable for? Below is a list of the names of all payment solutions discovered during the course of this project. This is only a fraction of all available payment solutions on the market. This list only includes payment solutions that are reasonably generic, i.e. can be used to make payments to more than just one company. All the web links below were validated as of 2002-11-19, but may have been removed since then. All the documents have been downloaded and can be presented on demand, but for practical reasons they have not been attached to the master’s thesis. Wolverton, Troy, FDIC decides PayPal's no bank, ZDNet News 2002-03-12, http://zdnet.com.com/2100-11-858445.html. Yahoo PayDirect full review, CNET.com, http://www.cnet.com/software/0-352109-1205-9602553.html?tag=dir-rev. Email from Rasmus Dorsch 2002-10-01. The given prices are standard prices only, and may be negotiated. Interview with Takehito Wakayama 2002-07-12, cofounder of Ebank Japan. O-mahony, Perice, Teware, Electronic Payment Systems for E-commerce (2001), pg 73, ISBN 1-58053-268-3. “Secure sockets layer”, a protocol developed by Netscape for transmitting private documents via the Internet. ePSO Inventory Database entry on Moneta Online, http://www.jrc.es/cfapp/invent/details.cfm?uID=255. Merchant Account Rates, MerchantSeek.com, http://www.merchantseek.com/merchant_accounts_rates.htm. AT&T PrePaid Internet Service, http://www.consumer.att.com/prepaidcard/prepaidinternet. “Short message service”, a service for sending short text messages to mobile phones. Mobile Operators Dominate SMS-TV Revenues, EuropePR.com, 2002-08-23, http://www.europepr.com/showpressrelease.asp?ArticleID=86. Promotions – Dial-a-coke, Telstra Mobile, http://www.telstra.com.au/mobilenet/cur_prom/dialcoke.htm. Interviews with NTT Docomo, Cybird, CTC, and Itochu in Tokyo, July 2002. “HyperText Markup Language”, the authoring language used to create documents on the World Wide Web. “Wireless Application Protocol”, a protocol that allows users to access information instantly via handheld wireless devices such as mobile phones, pagers, two-way radios, smartphones and communicators, in much the same way that web browser access web pages on the Internet. “General Packet Radio Service”, a standard for wireless communications which runs at speeds up to 115 kilobits per second, compared with current GSM (Global System for Mobile Communications) systems' 9.6 kilobits. Interview with CTC and Itochu in Tokyo, and presentation materials received from that meeting, July 2002. Interview with Mark Manasse, inventor of Millicent, in Mountain View California, 2002-09-19. Strictly speaking the merchant did not issue the individual scrip. The merchant entered a license agreement with the broker, allowing the broker to produce merchant scrip in a specified range of IDs using an agreed-upon secret. The merchant produced the ID range and the secret, but not the individual piece of scrip. O-mahony, Perice, Teware, Electronic Payment Systems for E-commerce (2001), chapter 6.1, ISBN 1-58053-268-3. O-mahony, Perice, Teware, Electronic Payment Systems for E-commerce (2001), chapter 6.4, ISBN 1-58053-268-3.
 ePSO Inventory Database entry on Mondex, http://www.jrc.es/cfapp/invent/details.cfm?uid=64. NTT Docomo Corporate Data, nttdocomo.com, http://www.nttdocomo.com/html/corporate_data.html. Presentation material by Robert Grönborg, Invest in Sweden Agency, Tokyo. Craddick, Donald, The Shakeout in Online Cash, 2002-03, StreamTrans.com, http://www.streamtrans.com/news/2002-03OnlineCashVISA.doc. eBay to aquire PayPal, ShareHolder.com, 2002-07-08, http://www.shareholder.com/ebay/news/20020708-84142.htm. Regan, Keith, PayPal To End Dot-Com IPO Drought, NewsFactor.com, 2001-10-01, http://www.newsfactor.com/perl/story/13856.html. Världens Barn, Sveriges Television, http://www.svt.se/varldensbarn. Usman, Zaki, Techtalk: SMS - What's all the buzz about?, Spider, July 2002, http://spider.tm/jul2002/blurbs.shtml. GartnerG2 Says Mobile Industry Obsessed By Third Generation (3G), and Has Forgotten The Consumer, Gartner.com, 2002-11-05, http://www3.gartner.com/5_about/press_releases/2002_11/pr20021105a.jsp. MasterCard International Fact Sheet, MasterCard International, http://www.mastercardintl.com/about/press/factsheet.html. Cohen, Charles, How Not to Start a Payment Network, speaking notes, 2002, http://www.consult.hyperion.co.uk/PubWebFiles/DigMon02/CharlesCohen02.pdf. Byström, Petterson, Cash, ett betalningssystems uppgång och fall, Master’s thesis June 2001, http://hem.passagen.se/leffep/cash/cash.pdf.